Headlines haven’t been kind to Lockheed Martin‘s (LMT) F-35. “America’s Most Expensive Fighter Jet is Also Its Worst,” Maxim wrote. “Report: The F-35’s Pilot Eject System Could KILL You And Definitely Will Maim You,” according to the Daily Caller. “The Pentagon’s Official F-35 Bug List is Terrifying,” said ExtremeTech. Government reports of the $400 billion program have also been scathing. Senate Armed Services Committee Chairman John McCain is a major critic, and Republican presidential front-runner Donald Trump has said he’d consider dropping the program if he gets elected. But a Marine pilot who has been flying the F-35 for nearly four years feels differently, even if some bugs still need to be worked out. “I love the airplane, and it’s great to be flying something that’s newer,” Maj. Brendan Walsh told IBD. He previously flew F/A-18C Hornets, which debuted in the 1980s, but he’s now flying a so-called fifth-generation fighter with stealth technology. “Even in today’s battlefield and even with what some people call immaturities on the F-35, I would hands down rather be in an F-35 than an F-18 in just about any situation,” Walsh said. The Marine Corps declared the F-35B variant combat ready in July, and Marine Fighter Attack Squadron 121, the “Green Knights,” became the first squadron to become operational with an F-35. Since then, the Marines have been preparing for the F-35’s first deployment to Iwakuni, Japan, next year. A short, expeditionary runway comprised of metal sheets was used at a Marine Corps base in Twentynine Palms, Calif., to practice short take-offs and vertical landings (STOVL). The F-35 has come a long way since Walsh started flying it four years ago. For example, it now takes Walsh eight minutes to hit the runway for take-off, comparable to the F/A-18, and down from two hours when he first started flying the new jet. He is also impressed with the F-35’s stealth, among other features, and is confident that even more advanced capabilities will come later. “The radar has performed well, the surveillance systems and electronic surveillance systems have performed very well, even in this configuration of the airplane, and they are only going to get better,” Walsh said. But while Walsh prefers the F-35 over his old jet, a dogfight in the new aircraft could be problematic. Last year, the military blog War Is Boring reported that an older General Dynamics (GD) F-16 outmaneuvered the F-35 in an air-combat test, setting off a firestorm of criticism. But the Pentagon has since said the F-35 wasn’t equipped with its full array of avionics, helmet mounted display or compete stealth coatings. It also is trying to downplay dogfighting, saying that’s not the F-35’s main mission. Another fifth-generation stealth fighter, Lockheed’s F-22 Raptor, was designated primarily as an air superiority fighter. But it was canceled less than halfway into its production run as costs soared, leaving the Air Force with only 187 operational planes. 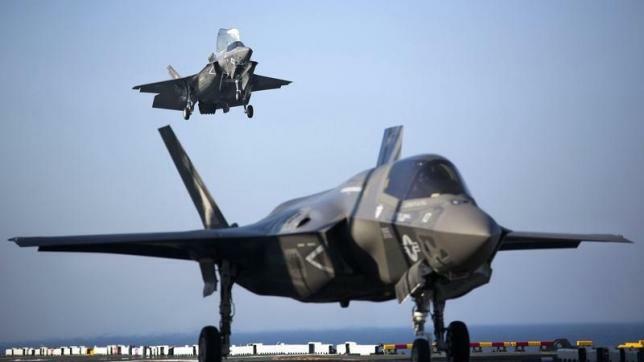 The F-35, which will have three versions for the Air Force, Navy and Marines, is seen as a multirole fighter, with production expected to hit 2,443 for the U.S. services and more than 900 for international customers. Meanwhile, China has been developing the J-31 fighter, which is believed to be made from stolen F-35 plans, and a new long-range air-to-air missile. Russia also has been expanding its radar and weapons capabilities. Still, he said, there have been “better performances recently” in dogfighting match-ups, based on what he’s heard from operational testers, and those tests are still ongoing. Other issues continue to hang over the F-35 program. Last month, at a House Appropriations Committee hearing, Marine Corps Commandant Gen. Robert Neller said that he has “concerns about where the software was” and wanted Lockheed to hurry up with fixes. The Pentagon’s chief weapons tester has pointed out glitches in the Autonomic Logistics Information System, which helps manage diagnostics, maintenance and supply-chain issues. Walsh’s squadron tested the troublesome system, considered the “brains” of the F-35, in December, and it set up the complex server in a remote area in Twentynine Palms. An evaluation of the ejection system also found that it’s possible lightweight pilots could break their necks while ejecting. A fix is in the works, and Deputy Defense Secretary Bob Work recently said he is confident ejection issues with lightweight pilots will be resolved. Also, until a software upgrade next year, the F-35 can’t fire its 25 mm cannon. But the evaluation of one warfighter who would fly the F-35 into combat is clear: “I feel way more survivable and way more lethal in the majority of mission sets in this airplane than with anything the Marine Corps has in the air right now,” Walsh said.